It takes a long time for a novel to go from initial idea through to finished book. It goes through initial draft, rewrites, finding a publisher, and then the publication process itself, which can sometimes take a year from when a publisher says yes to the book being released. I remember wondering, as I was writing Wolf Unleashed, whether the book would still feel relevant by the time it was officially published. I wrote chunks of that book while protests were going on in America about unarmed black people being killed, while people were being locked up, beaten, tear-gassed, or otherwise hurt for simply calling out people who were doing wrong. I remember doing what little I could with petitions and donations and sharing stories, hoping that those protests would have an impact, that the authorities would step in to address some of the issues of institutional racism that were at the heart of so much of the suffering, but I also remember wondering what that might mean for my book. If progress was made, my book might feel old before it was even born. It might be launched into the world already feeling like it was focused on last year’s subject. And then Trump was elected. He came into power and tried to have Muslims banned from the country, and I went back into a particular scene of the book, where the Muslim character Mehmood is talking about things he’s experienced, and rewrote some of the dialogue to draw a clearer parallel. Suddenly those moments with Mehmood started to feel more relevant again. And now we have stories on the news about children being taken away from parents, children being rounded up, children being put in cages. And I’m left wishing that my story, with it’s scene in which children are taken from their mother and put in cages, didn’t feel so relevant. I wrote awful things into the book, where a group of people are being treated as less than human, their rights and wellbeing ignored. And now I’m watching it happen on the news, reading articles about the inhumanity with which groups of people are being treated. I wanted my book to still feel relevant when it was published, but it’s like the old saying goes: be careful what you wish for. My book’s message was “Werewolves are people too” but it’s painful to look at what’s happening in the world and know that the message “refugees are people too” is just as real and important a message as ever. This suffering and dehumanising behaviour isn’t just something that happens in books, but it’s something that’s happening right now in the real world, and it’s heartbreaking to see it going on. There are organisations you can donate to if you want to help those suffering right now in the concentration camps Trump has set up. Act Blue has a fund called Support Kids at the Border that let’s you donate to several charities and groups all at once if you don’t know which group is the best one to give to. Let’s hope that the issues in my book start feeling less relevant sometime very soon. 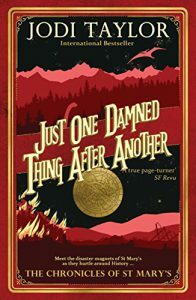 Just One Damned Thing After Another by Jodi Taylor (UK link, US link) is a fun book that walks the border between science fiction and fantasy. For the most part, it feels like science fiction, with futuristic technology driving the plot, but there are hints at elements from mythology towards the end that lend it a fantasy air. It tells the story of St Mary’s, a historical research organisation with a difference. These historians actually go back in time. Technological developments allow them to go back and see what actually happened at major historical events, answer key questions, and take recordings of what they see. The main character is Max, a historian who signs on as a trainee at the start of the book. She is surrounded by a mixture of academics, engineers, security staff, and medics, who are all disaster magnets and generally obsessed with getting a good cup of tea. It’s a lively story, told with a lot of humour and most of this humour comes from the interactions between the various characters. I did struggle sometimes to keep some of the minor characters straight, especially since they might be referred to by first name, last name, or nickname. There was a list of characters at the start of the book which served as reference and I found a big help, but it didn’t stop me from getting muddled now and then. There are some dark moments in the book. While the tone through most of it is light, there are some dramatic events that stand in stark contrast and the emotion of these sections really works, probably because of the contrast. It makes them feel more raw and real. On the whole, I’d say that this book is good entertainment. It’s an enjoyable read and very easy to get through. It’s a perfect holiday read for when you just want to relax with something amusing and fun. Where I think it struggles is in terms of a coherent plot. There are some plot threads that flow through the book as a whole, but there are times when the book feels more like a series of events rather than forming a solid whole. As the title suggests – it’s one thing after another. There are separate chunks of the book with their own focus and activities and I almost think it would have worked between if the author had made more of these distinctions, breaking the book into separate parts and treating each as a separate episode within the larger narrative. It did pull the plot threads together a bit at the end though, so this criticism is a fairly minor one. I think the author assumed considerably more historic knowledge of the reader than I had. There were references to historic events which were largely explained. Some of these references I got, but others just passed me by. Someone with more of a background in history than I have would probably have enjoyed this more, as it was I could have done with a little bit more information about the things being referred to. Thankfully those that were more critical to the plot were explained, so it was mostly the off-hand comments and throwaway lines that I ended up missing. Overall, I’d give this book four stars out of five. It’s not going on my favourites list, but I did enjoy reading it and I will look out for other books by the same author in the future. There’s a lot of advice out there for writers but one thing that comes up time and again is the advice to read. I whole-heartedly agreed with this advice. Read writers you admire and try to figure out what it is that they do that makes you like their work so much. Read books you dislike to try and figure out what it is that puts you off about it and avoid it in your own work. Read widely in the genre you write so that you can pick up on the tropes and cliches. Read in other genres to see how stories are crafted differently for different audiences. But I would also recommend reading non-fiction. There’s a lot that can be learned from books that can be useful in your writing, but I’m not talking about researching a specific subject with a book in mind. Reading more broadly can give you a foundation of knowledge to build on when creating your fiction. Personally, I read a lot of popular science simple because I find it interesting, I’m also very keen on psychology, which I think is a really useful area for writers to read up on. As we create our characters, we want to have them feel believable, like real, solid people with personalities that make sense and whose actions are plausible in their circumstances. Even for those of us working in science fiction and fantasy, we want the characters to feel like real people. Reading psychology books can give us insight into what makes people act in certain ways and that can help as build more nuanced characters. If you’re writing stories of political intrigue or dealing with the rulers of a fantasy land, it could be useful to read about historical rulers, but I would also recommend The Dictator’s Handbook, which I’m currently reading, a book all about the ways people gain and keep power, and the rules by which they’re able to rule. There’s an old adage “write what you know” which a lot of writing coaches shy away from these days, but there is an element of truth to it. If you know a subject, you’re more likely to be able to write about it in a way that people believe in. At the very least, you can avoid the more obvious mistakes that will make experts on the subject cringe. If you want to follow this piece of advice, then the next step is to try and know more about as wide a range of topics as you manage. In other words: read more non-fiction.